Many churches strive for a quality entry point for men to gather, be built up, and encouraged. This often takes the form of Saturday morning breakfasts. Quality food is essential, but more so is quality content. ISI provides the answer to the question of content for men in all walks of life whether you meet every month, every other month, or once a quarter. We have had the privilege of partnering with the best men’s leaders from around the country and now you can bring these world class speakers to your church! 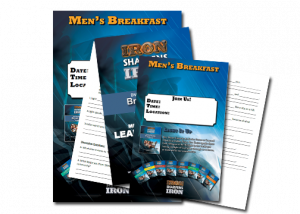 In taking the best of 20 years of ministering to men to create this all new Men’s Breakfast DVD Series; we are pleased to provide the best content for your next men’s ministry breakfast. Rev. Bryan Carter is the Senior Pastor at Concord Church in Dallas, Texas. Rev. Carter speaks of God’s call to us to be His light in the world and letting the light of God shine through us at home, at work and in our communities. Dan Seaborn, Founder of Winning At Home, focuses his ministry on building strong marriages and families. Mr. Seaborn discusses Joshua’s situation after Moses’ death, encouraging us to learn from our mistakes rather than allowing them to hinder God’s plan for our future. Dennis Rainey is Co-Founder of FamilyLife, host of a daily radio program and author of numerous books on marriage and family. Mr. Rainey describes five steps in a man’s life, challenges us to identify the step we’re on and urges us to take the next step up. Dr. Joseph Stowell is the President of Cornerstone University and author of more than 20 Christian books. Dr. Stowell asks the question “Who are you?” and uncovers a Biblical answer to that common question which helps unleash our identity in Jesus Christ. Kenny Luck is the Men’s Pastor at Saddleback Church in Lake Forest, California and the founder of Every Man Ministries. Mr. Luck’s unique sense of humor and powerful insight helps us find God’s calling in our lives and reminds us that He will walk with us if we invite Him to do so. Voddie Baucham serves as Pastor of Preaching at Grace Family Baptist Church in Spring, Texas. A dynamic speaker, Mr. Baucham talks through the story of Joseph, how Joseph overcame temptations associated with power and money to become God’s man at a critical time, and how we too can overcome our circumstances to stand faithfully for God.